This Friday, March 21, it will be Harmony Day. Harmony Day is a government initiative which began in 1999, inspired by the United Nation’s International Day for the Elimination of Racial Discrimination, which takes place every March 21 around the world. It is a public holiday in South Africa, commemorating those who lost their lives in the struggle against apartheid. On Harmony Day, primary schools, workplaces and communities come together to celebrate diversity and learn respect for each other. The message of Harmony Day is Everyone Belongs, and people are encouraged to dress in orange or wear orange ribbons to show their support. 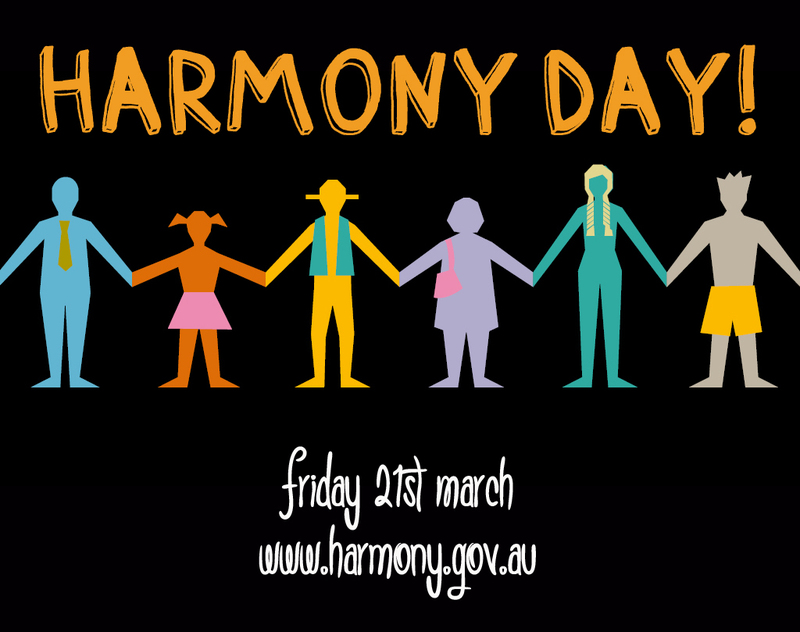 Harmony Day is managed by the Department of Social Services, and is part of Diversity Week. Australia is one of the most multicultural countries in the world, with people from more than 200 countries and more than 150 languages represented. More than a quarter of the population are migrants, and clearly we all need to learn to get along. Although studies find that Australia is a generally tolerant society, and most migrants feel that they are accepted as part of the community, that isn’t the same as a society where diversity is welcomed, and more needs to be done. The English word harmony can mean either “agreement, accord” (as Our views on child rearing were in complete harmony), or “a pleasing combination of elements” (as in The harmony of colours in her decorating scheme gave the house a relaxed feel). It is especially connected with music, where harmony is the use of simultaneous notes or chords. The word is from Old French harmonie, from the Latin harmonia, based on the Ancient Greek harmozo, meaning “to fit together, to join”. In former times, the word harmony was used to mean music itself. Harmonia was the Greek goddess of harmony and concord. She was seen as the personification of harmonious love between all people, of social order and civic unity. She was married to the Phoenician prince Cadmus, the founder of the city Thebes, and is famous because of a magic gold necklace she received as a wedding present, in the shape of two serpents. Although the necklace made any woman who wore it eternally beautiful and youthful, it had the unpleasant feature of bringing grave misfortune to its owners. The necklace was wrought by Hephaestus, the god of metalwork, who became enraged when he discovered his wife Aphrodite having an affair with Ares, the god of war. He vowed to wreak revenge by cursing the lineage of any children arising from the affair: Harmonia was the result, and so she was given the jewellery of doom. Harmonia and Cadmus were transformed into dragons as part of the curse, and all Harmonia’s female descendants had horrible times because of the necklace. One of her descendants was Queen Jocasta, the mother of Oedipus – a famous example of family life going terribly wrong. Eventually, after generations of misery, someone stole the necklace to give to his mistress, upon which her son went mad and set fire to her house, killing her and mercifully burning all that she had possessed, including the necklace. Why no one thought to destroy the thing earlier is a mystery – I suppose looking eternally young and beautiful was too hard to give up. Harmony has been used as a girls name since the 18th century; although originating in England, it quickly gained more use in the American colonies, and to this day is more popular in the United States than elsewhere. An American connection to the name is the Harmony Society, an esoteric Christian sect which came to the United States from Germany in the early 19th century, named their first commune Harmonie, and built several towns with the name Harmony. A statue of the goddess Harmonia is in the Harmony Society Gardens in the Old Economy Village in Pennsylvania, showing the high esteem they held for the virtue of harmony – as I think all communes must do, otherwise communal life would soon become intolerable. However, when they built New Harmony in Indiana, they included a shrubbery maze, to indicate that the path to harmony was not easy. Harmony is a misunderstood virtue: it is perhaps too easy to dismiss those aiming for harmony as submissive, or passive-aggressive, or to see harmony as stifling, controlling, dull, or even totalitarian. Maybe when we think of harmony, we imagine everyone repressing their individuality to conform, being insincerely “nice” to each other, and minimising differences between people. But in a truly harmonious society, people would recognise and value each other’s individuality, taking pleasure in their differences. Harmony isn’t about us all shutting up so we can fit in, but allowing each other to express ourselves, so that the entire range of the notes of the human chord can be heard together. In music, harmony occurs when there is a balance between tense moments and relaxed moments – and that’s good in harmonious relationships too. Harmony doesn’t mean that things are always mild, pleasant and bland: it means that there is a healthy balance between dissonance and concurrence, between conflict and peace. Of course, harmony is very subjective, with each of us having our own idea of what this healthy balance looks like: no wonder harmony is so difficult to attain! Harmony is a pretty name, and extols an unusual virtue, which is secular rather than spiritual, and communal rather than personal in nature. It’s also a musical name, more fashionable than Melody, but less trendy than Cadence, and so a nice harmonious balance between them. It fits in with choices such as Harper and Harlow, and in Victoria is a similar popularity to Harlow, in the 200s. Harmony received an excellent approval rating of 75%, making it one of the highest-rated names of 2014. People saw the name Harmony as pretty and sweet (29%), and a beautiful musical name (25%). However, 16% thought the name seemed unprofessional or lower class. I know a Harmony! She suits the name completely – really sweet and a bit of a hippy. Funnily enough, I didn’t think of Harmony as a hippy name, but I guess it kind of is.